These places are something special. Maybe, unlike what you’ve ever seen. Rich in history, it is sacred land that holds a wealth of sources, a thriving environment and significant geological features. Outlined on the east by the Cascade, Sierra Nevada and Tehachapi mountain ranges, and decorated on the west by the California Coast Ranges and San Francisco Bay, the Central Valley is overwhelmed with breath taking scenery and phenomenal fishing opportunities. Abundant rains and melting snow from the Sierra Nevada’s feed the San Joaquin and Sacramento rivers that run through the Central Valley - extending from Shasta county in the north to the Kern county in the south. It’s known for being one of the most productive agricultural region not only in California, but in the world. In the 1800’s, an extensive population of Yokut Indians lived on the shores of the now dry Tulare Lake. The area provided them with reliable food and resources, while other tribes like Maidu and Miwoks migrated to the foothills of the Sierra Nevada. Tribes used reed tule, branches and grasses for their baskets, homes and canoes. The Central Valley made history in the winter of 1861-62 when it experienced one of the most devastating flood that took thousands of lives and turned the valley floor and much of the state into inland seas for months. Nowadays, there are more farms than fishing holes, but this vast valley has a handful of fishing spots that are worth checking out in the spring and summer. Although late spring usually makes the trout succumb to heat, with Mother Nature’s indecisiveness over the weather this year, I anticipate the fishing will be fun for a couple more months. My goal for this story was to visit a few different locations in the area that I was unfamiliar. However, we fortunately received several back-to-back snowy-storms that forced the parks to close. 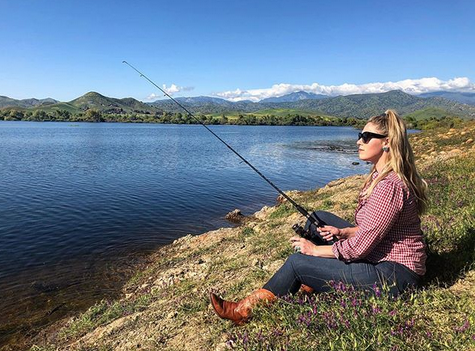 But as a Central Valley girl myself, I still want to showcase some of the many viable alternatives around the foothills and lower San Joaquin that not only feature exciting fishing spots but offer a beautiful scenic journey. Lake Success is just a few miles east of Porterville off Highway 190. This lake can be inconsistent as you never know if it will be a hot spot or not. But, it definitely also depends on what you are trying to catch. There are many freshwater species here like crappie, carp, bluegill, trout, catfish and largemouth. The mid-April, my brothers Zeb and Jacob walked the northeast banks, in hopes of catching a big mama bass. Many were swimming next to the banks in the shallow waters, protecting their fry underneath wood and debris. However, the only thing they had any interests in was protecting those fry. They weren’t biting. In the winter months we have a secret spot at the lake that provides for an abundance of nice rainbows. My success at Success is always attributed to using live crickets. Bass fishing off a boat is pretty good here also. Located roughly 25 minutes from Bakersfield, the easily accessible Lower Kern river is said to be a good fishing spot because of its controlled flows. However, as the snow melts from May-June, trout fishing can be dangerous or almost impossible. April and May are said to be some of the best times to fish this spot as the river is usually low. In the early spring, the Department of Fish and Game heavily plants the river with good size rainbows. Dry and dropper fly combinations or double nymph rigs dead drifted under an indicator are amongst anglers favorites. Drive a little further and you can hit some hot spots in the mouth of the Upper Kern. In the winter and spring months, anglers have caught some big trophy fish up to 28 inches and up to 8 pounds, as reported by the CDFW. Drive a little further and you will hit Lake Isabella which is said to have some awesome trout, bass and large crappie. On May 19, Lake Isabella hosts its annual Carpfest, a throw down that will pit teams of two carp fly anglers. The profits will benefit local conservation groups, Kern River Conservancy and Keepers of the Kern. Below Pine Flat Reservoir sits the heavily planted Kings River, 30 miles east of Fresno off of Highway 180. San Joaquin Fish Hatchery is real close and CDFW Hatchery staff plants is twice a week. While fish releases aren’t common from Pine Flat Dam to Avocado Lake, there is plenty of public access and fishing can be good. The Lower Kings is a popular heavily used area because it is planted on a regular basis. This is a good place to take a child or inexperienced angler. Stocked fish eat darn near anything and allow you to fill your bag in a short amount of time. Continue driving up Hwy 180 and you will run into Weaver Lake. The mostly mild hike is a 6.5 round trip. The scenery is stunning and the water is nearly crystal clear. This is an awesome place to take your family and through a line in around the lake. However, this area is heavily traveled. You can also ride hardback into this lake, as well as Jennie Lakes which is 8.4 miles away. Drive even further up the 180 and you will arrive at Hume Lake, approximately 22 miles from Weaver Lake. With an elevation of 5,200 feet, outstanding rainbow trout are planted here during the spring and summer months, while there are also brown trout, small and largemouth bass, crappie, bluegill and catfish. The scenery is absolutely stunning and Ten Mile creek which feeds into the lake, offers arguably even better fishing!